It’s not the dreaded Minecraft 2, but there is definitely a brand new Minecraft game coming next year. Minecraft Story Mode is from Telltale Games, the makers of popular adventure games based on properties like The Walking Dead and Game of Thrones. The game will feature a narrative driven by player choice. 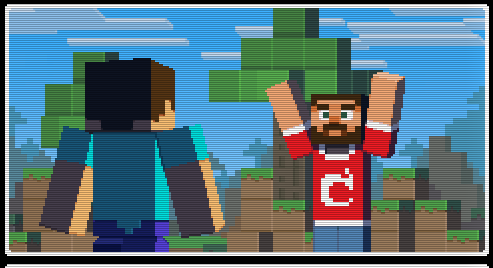 It will not feature Steve, but center around all new characters in the Minecraft world. The new game is not an add-on or mod for Minecraft, but an entirely new game that will premiere on PCs, consoles and mobile devices. It will be released in episodes like Telltale’s other adventure games, with the first episode out some time in 2015. Mojang announced the game in hilarious fashion on its blog with “Info Quest II,” an interactive announcement styled like an old PC adventure game. You should really check it out and play it for yourself here. Make sure to ask about Minecraft 2! So what do you think of the first announced Minecraft spinoff? Discuss it on our forums.